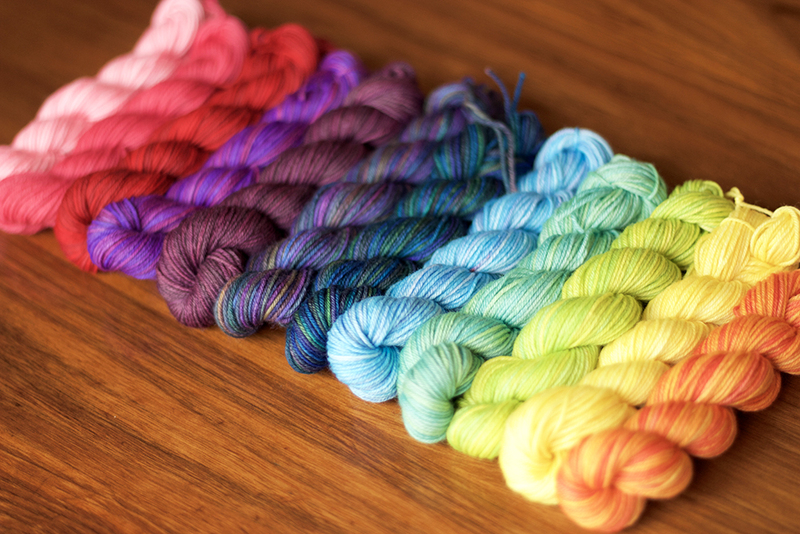 • Mini Sock Yarn Skein Sets have been restocked and the plan is to keep restocking as regularly as I need to in order to have them available as frequently as possible between now and the holidays - I'll be aiming for weekly restocks, which I think oughta do it. • The 2018 Calendars are now available in the shop! They will also be included as part of our holiday Gift Bundle which will be available mid-November. Stay tuned for lots more about that! • There are still a handful of White Light Skein Sets available. • Mitten kits are next on my list! I'll be restocking lots of colourways and I'll even have a new pattern coming soon! I have a vision of our future that involves a big studio with high ceilings and exposed brick walls, with shelves upon shelves of always well stocked yarn and kits. Of a dedicated spot for shipping supplies, a spot for photography and a maybe even a shopfront where people can visit us in person. Maybe one day, but not today. Today I'm happy to be making kits in my home office in my pyjamas. I'm content to never be more than 12 feel away from my office and yarn stash so I can pounce on a project the second inspiration strikes. And I'm happiest of all to be doing it surrounded by those I love the most.